Want to buy a best leather case for your GoPro camera to keep it safe from any accident or unwanted damage. Do you want to add more style and fashion by adjusting your GoPro camera into a best leather case and Cover Cases? Do you want to keep your GoPro camera away from dust, scratches or any unnecessary damage? If the answers to all these questions is YES, then you are at the right place to find all the solutions to your problems easily. GoPro leather cases are used to keep your GoPro camera away from any unwanted damage or accident. It keeps your camera sound and secures from scratches, dust, and abrasion as well. On the other hand, they also add more fashion to the GoPro camera with their sturdy design and bright color. If you are looking to add more style to your GoPro camera, a leather case is the best option for you. Keeping the significance of a leather case in mind, we have decided to compile and review a list of best GoPro leather cases so that you can make an easy choice and decide to buy the best GoPro leather case right here, right now. The products we have listed are researched thoroughly on the basis of their performance, durability, sturdiness, reliability and user ratings so that you can have a peace of mind while choosing a best GoPro leather case. 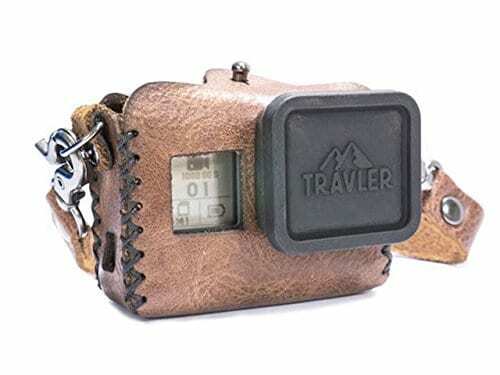 Travler Handmade Leather case tops our list for being the best GoPro leather case available on the market in 2019. The leather case has got the attention of many people who want to keep their camera save from any unwanted damage. The leather case is quite sturdy and gives an eye catchy look as well. It adds more style and fashion to your GoPro camera. It is specially built for people who want to go on an adventure and they don’t want to keep their camera prone to different accidents. On the other hand, the best GoPro leather case is able to adjust your camera so that it looks more stylish. The best GoPro leather case has got high end handmade stitching as well. It consists of a coarse wax thread for a durable and rugged finish. The leather case is compatible only with GoPro Hero 5 and Hero 6 so you must keep the model of the GoPro cam you are using in your mind before buying the leather case. Furthermore, The semi-aniline grainy leather is used in the construction of this carrying case which gives an antique look. The color of the leather case is brown. There is a neck strap available with this leather case which allows you to carry your GoPro camera easily in your neck while you are exploring beautiful sites. The LCD screen cutout is also present which allows you to touch the screen of your GoPro Hero 5 or Hero 6 camera easily. This leather case is one of the best GoPro leather cases you will find on the market. Keeps your cam away from scratches. Only compatible with GoPro Hero 5 and 6. Travler Handmade Leather case is the best GoPro leather case compatible with GoPro Hero 5 and Hero 6. The construction of the leather case is sturdy and it gives a unique look to your camera as well as adds more protection to it. Go for it, if you need a durable leather case in an affordable price range. TELESIN PU Leather Carry Case is another compact and portable leather case which adds more security and protection to your GoPro camera. 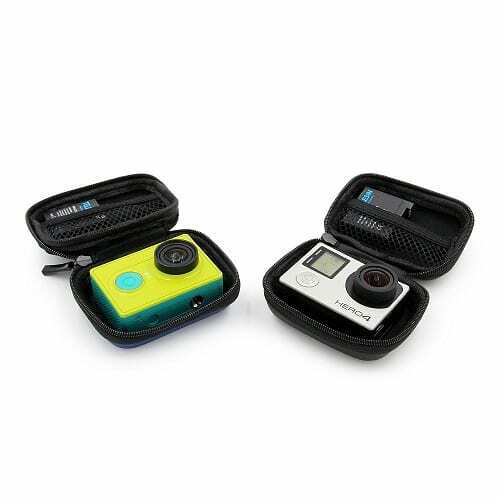 The best GoPro leather case showcases a bright blue color and looks quite sturdy as well. The cool design will make you fall in love with this leather case. On the other hand, it has got a construction of hard PU leather which keeps your camera in safe environment. Furthermore, the leather case comes in with a lens cap which keeps the camera lens safe and away from scratches or abrasion as well. The leather case is mini and portable as well. You can easily slide it into your pocket while it will be keeping your favorite GoPro camera. The best GoPro leather case is compatible with almost all versions of GoPro camera. It is suitable for GoPro Hero 1, Hero 2, Hero 3, Hero 4, Hero 5 and Hero 6 as well as other action cameras. You can have a peace of mind while buying this leather case as it can accommodate almost all models of GoPro cameras. The construction is made from premium leather materials which add more durability and reliability to the leather case. Furthermore, the leather case has got zipping procedure. Just place the camera in the leather case, zip it fully and BINGO, your camera is now safe from all type of accidents or unwanted damage issues. Keeps cam away from an accident. Lens Cap for protecting the camera lens. TELESIN PU Leather Carry Case is the best GoPro leather case which has got a construction of high-quality PU leather. It keeps your camera safe in all kinds of the environment as well. Go for it if you need a zipping leather case for your GoPro camera in a reasonable price. Travler is introducing the best models of GoPro leather cases and this GoPro leather case is a pioneer in all regards. The best GoPro leather case is quite durable and sturdy and gives a fine look as well. 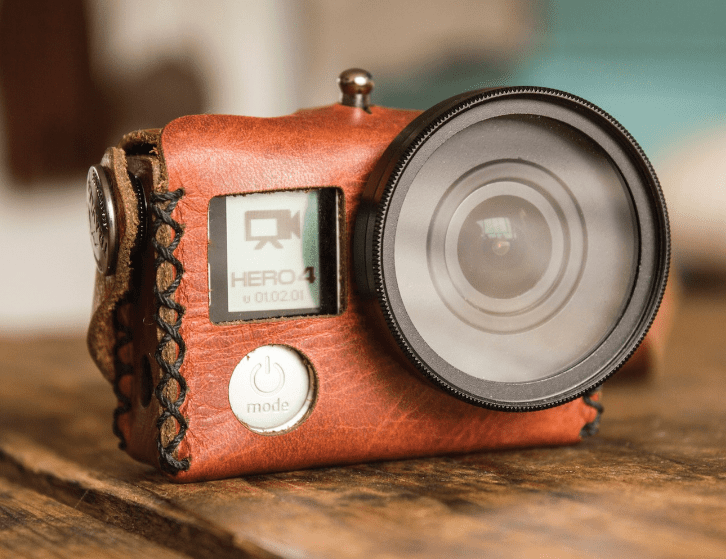 The leather case is totally handmade and it adds a more antique look to your camera. Furthermore, this leather case perfectly fits your GoPro camera and will keep your camera safe from all type of accident or emergency problems as well. The best GoPro leather case has got a premium leather and it adds more style to your GoPro camera as well. On the other hand, the screen cut out and space for power button is also available which lets you access the touchscreen easily. The leather case comes up with LCD BacPac so that you can add an external LCD panel to your GoPro camera. It will cost a bit more as compared to other leather cases but if you need an LCD BacPac as well, this leather case may be the best choice for you. 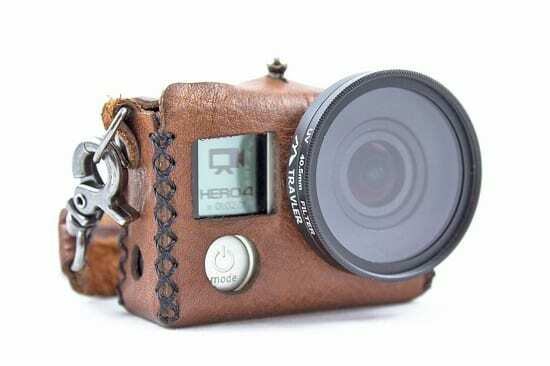 The leather case is only compatible with GoPro Hero 3, 3+ and Hero 4. There is a 40.5mm Lens filter adapter available with this GoPro leather case which keeps the camera lens away from dust and scratches. Furthermore, the leather case has got high-end coarse wax handmade stitching which makes it quite stylish. The grainy leather and the brown color adds more attraction to the leather case. There is a neck strap available with this leather case which lest you keep the GoPro camera in your neck without any worries. Only suitable for some GoPro cams. Travler Leather Case with LCD BacPac is the best GoPro leather case which comes in with a hefty price range but provides many awesome features and adds more color and style to your GoPro camera. Go for it if you need a leather case and LCD BacPac for your GoPro camera to enjoy shooting videos with more style and added security. First2savvv Leather protective case is another versatile GoPro carrying case which adds more protection and security to your GoPro camera while you are on an adventure. The best GoPro leather case has got a high-quality construction which makes it more sturdy and durable. The high-quality PU leather is used in this leather case which makes it a lot more sturdier and durable as compared to other GoPro cases. Furthermore, the best GoPro leather case is compact, lightweight and portable as well adding more security and style to your GoPro camera. There is a strap available with this leather case which allows you to wear the camera on your shoulder or hang it around your neck easily. The camera will always be ready to shoot when you are hanging it around your neck with the help of First2savvv leather protective case. The bright pink color of the leather case makes it more attractable for female adventurers who want to enjoy taking beautiful shots of different places with a stylish GoPro camera. On the other hand, the leather case protects your camera from every possible danger. It keeps the camera away from scratches and abrasion as well. The soft inner layer is designed in such a way that it can keep the LCD screen away from scratches. The leather case comes in with a cleaning cloth as well which allows you to clean the camera form almost every aspect. It is compatible with GoPro Hero 5 and Hero 6 only so you better keep the model of the GoPro camera you are using in your mind before buying this leather strap. Inner Layer keeps LCD screen secure. Suitable for only GoPro Hero 5 and 6. Not good for male GoPro users. First2savvv is the best GoPro leather case available in a very reasonable price range. 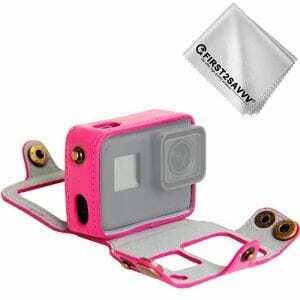 It has got many advanced features and will keep your GoPro camera safe from all type of accidents or emergency. Go for it if you need a perfect GoPro leather case in an affordable price range. Makit PU leather carrying case comes at the last of our list but provides some of the great features in an affordable price range. 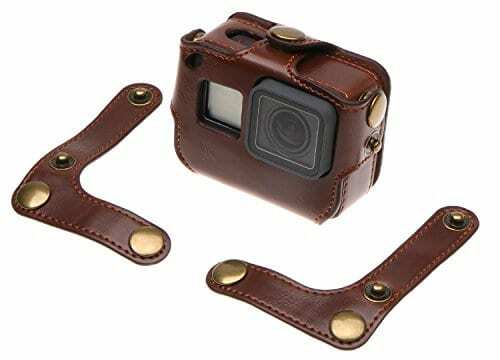 It has got a retro style and adds more of style and fashion to your GoPro camera when its adjusted in this leather case. The leather case has got premium quality construction. PU leather is used in the construction of this leather case so that to provide durability and extra protection at the same time. The best GoPro leather case is very lightweight and portable. You can take it anywhere you want. There is a neck strap available with this leather case which allows you to wear the GoPro camera around your neck easily. The waist strap is also available for more portability. Well, the GoPro leather case is only compatible with GoPro Hero 5 and Hero 6 respectively so you should keep the model of GoPro cam you are using in your mind before buying this leather strap. The color of the leather case is brown and it adds a more stylish look to your GoPro camera as well. Only compatible with GoPro Hero 5 and Hero 6. Makit Leather carrying case is the best GoPro leather case for GoPro cameras providing extra security and protection and a classy look at the same time. Go for it if you need an ideal retro style leather case for your GoPro cam in an affordable price range. Well, after a long review of some of the best GoPro leather cases to buy in 2019, we are sure that you can now a perfect choice depending on your requirements and budget. If you still want our recommendation, we will recommend you to buy the brand new Travler handmade Leather Case as it has got the best style and adds extra security to your camera as well. So, make up your choice and start using a leather case for adding more style and extra security to your favorite GoPro cameras.